The journey from Delhi to Dehradun was fairly uneventful, except to say that Delhi station first thing in the morning is an amazing place. Busy people moving everywhere; porters carrying extraordinarily heavy loads; people on the train tracks with hoses, washing away what has fallen through from the carriages whilst standing in the station; the odd cow. Our train istelf was nothing like the pictures one imagines of trains in India. No slatted windows, no crowded carriages. Instead, airconditioned standard class, breakfast served at our reserved seats and free newspapers. And a sense of expectancy in the air as India was due to play Bangladesh in the Cricket World Cup that evening. 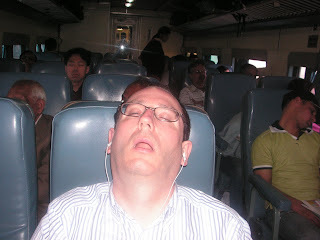 Oh, and as it was a sx hour journey, the odd opportunity for forty winks.